For years, The Chicago Bears predicated their entire offensive philosophy on running the football down the opposing teams' throats. Unlike some teams that utilize their fullback exclusively as a blocking back, the Mike Ditka-era Bears took full advantage of the running and receiving skills of the fullback. Actually, having a multi-dimensional player at that position was a requirement, not an option. Matt Suhey filled this role perfectly as a compliment to Walter Payton from 1980 to 1989. Suhey's career was coming to an end by the late 1980's. The Bears possessed 2 picks in the first round of the 1988 draft, the extra coming from the Washington Redskins as a result of the Wilber Marshall trade. Chicago spent their first pick, #24 overall, on Brad Muster, a 6' 4" 230-pound halfback from Stanford. Chicago would utilize Muster as a fullback-the perfect complement to speedy halfback Neal Anderson. Muster didn't start regularly until the 1989 season, although he caught a short pass and turned it into a 50+ yard gain at Tampa in 1988. His role expanded in the '89 season, and by 1990, Muster' rushing, blocking, and receiving skills were being featured. He led the team in 1990 in receiving. Muster had a unique running style-many commented that it looked like he was running very slow-but he was very elusive at the point of contact. If he didn't high-step over the defender, he could veer off to the left or right. And if the defender was not lucky that he made them miss-he could lower his shoulder and be a human battering ram. After Muster's breakout season in 1990, unfortunately, his career in Chicago began to wane. Injuries plagued him throughout 1991. A nagging hamstring injury, then a shoulder problem sidelined him for much of that season, along with Neal Anderson. In 1992, Muster had shining moments, such as a 50 yard sweep against Atlanta. After the disappointing 1992 season, as Dave Wannstedt was entering as Chicago's new coach, Muster expressed the desire to be a featured back in a one-back offense. This did not fit Wannstedt's philosophy of a featured tailback with a blocking-only fullback in front of him. Despite this fact, the Bears put an equal money offer on the table for either Muster or New Orleans' fullback Craig "Ironhead" Heyward, who were both unrestricted free agents. Muster declined, Chicago signed Heyward, and ironically, Muster signed with New Orleans. Muster barely touched the ball with the Saints due to injuries, and retired after the 1994 season. 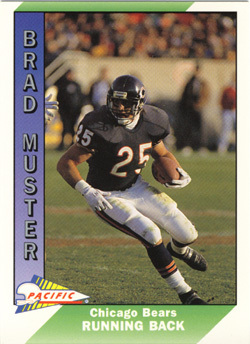 Brad Muster was a multi-talented throwback, and it is a shame that he couldn't have played longer for the Chicago Bears. Muster is a member of the Staford University Hall of Fame, class of 2001. Voted Pac Ten Offensive Player of the Year in 1986. Rushed for 2014 yards in his Bears career. Also caught 169 passes for 1623 yards. Led the Bears in receiving in 1990; featured in Greg Landry's new passing offense that season. One of my funniest childhood memories remains of being at Solidier Field in 1988, at 17 years old, sitting in front of three women that chanted "Hand it off to MUSTARD" the whole game. They truly thought his name was Brad Mustard.